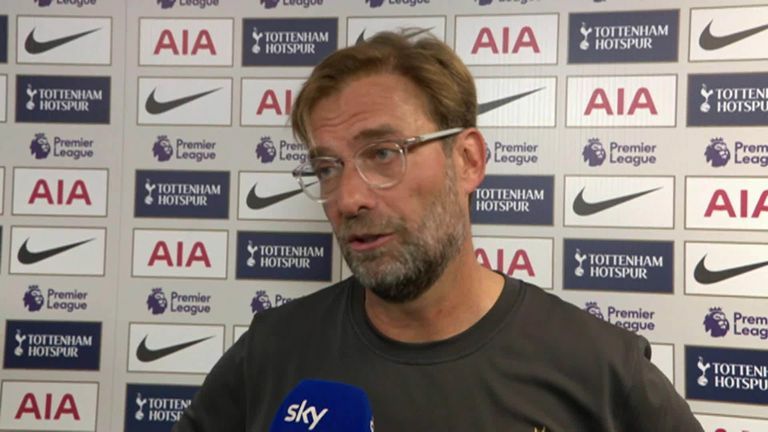 Jurgen Klopp described Liverpool's victory over Tottenham as their best performance of the season as they maintained their flawless start to the season. Goals in either half from Georginio Wijnaldum and Roberto Firmino condemned Spurs to a second straight defeat as the relentless Reds made it five wins from five to move to the top of the Premier League. "It was very good. It was a very intense job and the boys did it. It was a deserved win," Klopp told Sky Sports. "Over 85 minutes we were dominant with the ball and without the ball. We caused them massive problems and the things they usually do that usually work didn't today. "I don't take things for granted because the boys came back after an intense international break abroad, had one session and then played and stuck to our plan like they did today. "Respect. That was really good. Everybody worked so hard and it was a good performance. "We played against one of the most confident teams in football. They are so used to what they do that it is so difficult to deal with and means we had to be compact. "When we had the ball we were really clear and it was the best game of the season so far. "I like the options we made, the passes we played. The performance was much better than the result."